We were here to celebrate a friend’s birthday and I’m not at all impressed by the quality of food served despite the numerous raving reviews. Overall, we feel that Amici is a fine-dining wannabe (as evident from the minute portions and pricy menu) but lacked the quality and service standards. 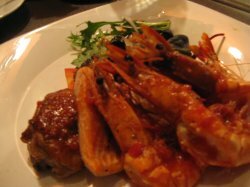 The portion of this grilled platter – consisting of grilled prawns, Norwegian salmon and chicken thigh – was considerable small given that it was supposed to be good enough for 2 pax sharing. 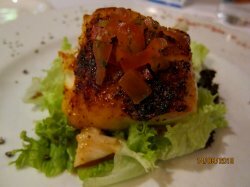 Again, I find that their seafood tend to be overcooked, resulting in a dry and tough texture. The slightly sour tomato base sauce was appetising and enhanced the overall flavour of this otherwise light dish. Consisting of lamb rack, tenderloin and chicken thigh, this mixed meat grill was much better than its seafood counterpart. The meat was succulent and tender, especially the beef tenderloin. The accompanying truffle red wine sauce and chef special dip is a must try as it blended very well with the slightly charred meats. A very light dish that lacked the distinctive buttery herb fragrance and zesty salsa flavours we were expecting. Thankfully, the fish was nicely prepared and not overcooked. The texture was soft and had retained the natural moisture of the meat. The best dish we had this afternoon. The beef was rich in flavour and chewy in texture. 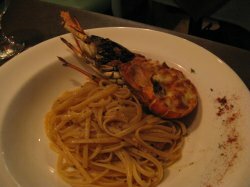 Overall, Amici seemed to fare better in their meats compared to the seafood dishes. At these prices, there are definitely better alternatives in the immediate vicinity of Holland Village. Came here with a girlfriend of mine because Park was closed (doh!). 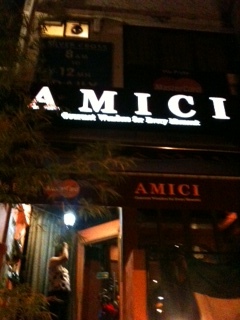 Amici had long been on my list of must-try's and since everyone says it's good, I thought to myself: "Why not?" 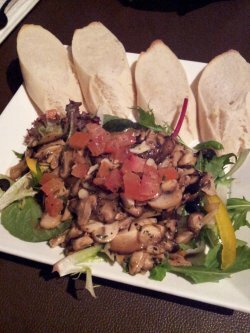 We had the sauteed mushrooms for starters. This was good but I think mushrooms are always a safe choice. Mushrooms already have this irresistible umami-ness so you can't really go wrong preparing it or eating it. 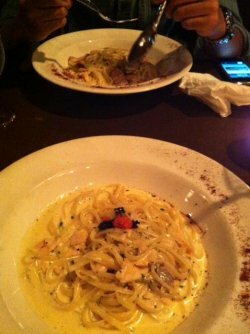 As for the mains, initially I wanted Vongole but since it was sold out, both of us chose a carbonara-type dish. My friend had the risotto while I had the pasta. I was a little disappointed at how average the pasta was. It was a little heavier than usual (some may like it), but unfortunately, it didn't hit the spot for me. As for my friend, she said the risotto was just too "gelat". We noticed everyone else ordering seafood/tomato-based pasta and they all smelled really good so.. perhaps we made the wrong choice. I still trust other Italian eateries for great food. For now, just not Amici. I went to the restaurant wanting to have their tortellini, but was told that it was sold out for the day, and the waitress recommended, Fettuccine alla russa. Generous serving of smoked salmon with caviar with thick vodka cream sauce. Its so delicious that I cant help but to think that the serving is too small! I have been to amici a few times over the years, and I cant help but to notice the drastic increase in price. At least a $5 hike in my favorite, Tortellini con prosciutto e funghi. The website no longer show the accurate price. For the price that it charge, they could well afford a renovation, which in my opinion, is really required. Their leather seats are all cracked, and the shop looks old and worn-down. The look of the restaurant is not fitting for the food, and the price. ate there many times especially when I got the discount card. Bought the discount card twice, get to enjoy their chocolate cake. both different for the cards I got. Ate there with boyfriend and also brought my family there to celebrate birthday. Their food is expensive but with the discount cards, is worthwhile. 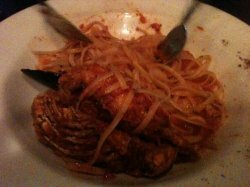 the spaghetti (clayfish spaghetti) and pizza taste very nice that everytime that I go back, I will eat those food. 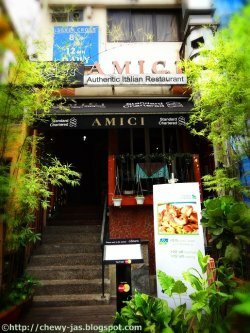 In an unassuming row of shophouses in Holland Village, there lies a small but happening restaurant Amici. The service can be, at times, sporadic and the waiters forget to bring random items of cutlery or accidentally charge for two drinks instead of one. However, overlooking the minor blunders with the wait staff, the food is well worth the hype. 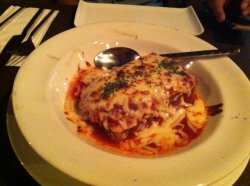 The eggplant parmigiano is abundant with cheese and, at the appetizer portion size and price (S$12.80), is almost like a meal in itself. 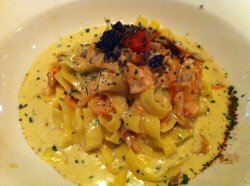 Fettuccine alla russa ($20.90) is a main dish to drool over - with salmon and caviar over a bed of fettuccine, coated with a generous serving of vodka sauce. A simple meal consisting of an appetizer and a main dish can leave you well fed and asking for take away containers. Reservations are generally required, as the place gets extremely busy on the weekends, but the trip and the food will definitely leave you wanting to come back again and again. 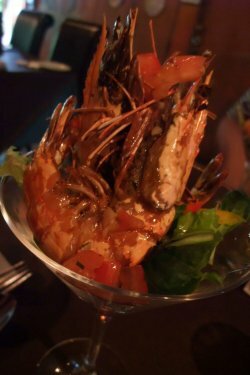 We ordered the Mesclun salad topped with whole tiger prawn as appetizer. 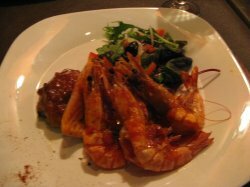 The gigantic tiger prawns are very fresh, with crunchy meat. 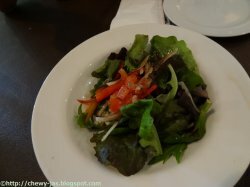 The salsa salad is very appetizing due to the sourness. Good match with seafood! 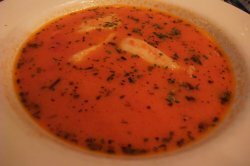 Next we have the Creamy of mediterranean fish soup. Although the soup has a rich redish colour, it actually tasted pretty plain. Not my faourite for sure. As for main, we ordered the Crab meat aglio olio. 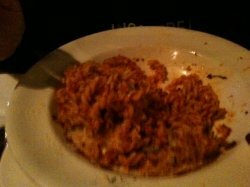 The well-cooked spaghetti with generous amount of crab meat is probably the highlight of this meal. Thumbs up. 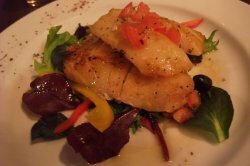 Halibut fish served with garden vegetables & vineigrette sauce is quite Ok. The fish is fresh and pan-seared just right, but the dressing lacks of some 'wow' factors though. To end the meal, we had the Award winning tiramisu. However, this tiramisu is not the creamy style that I like. I reckon this one is a bit too wet, and turns watery in your mouth. Had dinner with close friends last night and there was a wine with cake deal that we took. 1) Pepperoni Pizza - the crust was the thin crispy type but I found the tomato base too sweet. Like the bottled one supermarket carry. I have had better ones elsewhere. 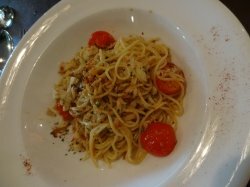 2) Crabmeat Aglio Olio - this is their signature pasta dish. We ordered 3 portions of it! 2 of us found it rather bland but my other friend said it was ok. 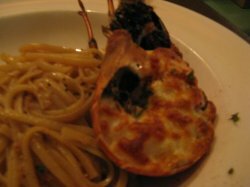 Otherwise, the crabmeat is adequate and the pasta al dente. Personally it's a little ordinary to be called 'signature' but at least it's not awful. Service was ok considering they were running full house last night. Having said that, not likely for me to return on my own. 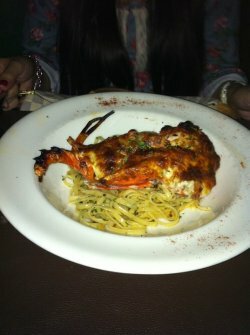 My aunt had especially recommended their lobster, and we ordered two of it, which was served with spaghetti, and another two of their platter which includes chicken thigh, Norwegian salmon, and large prawns. Honestly, when the dishes first came, we felt that the serving was really little and it actually costs us $39.90. Needless to say, the lobster was fresh and sweet as well! 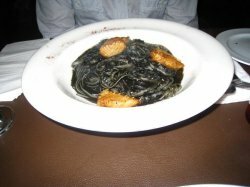 I had my first squid ink pasta at Amici Italian Restaurant. I never thought I would ever touch that in my life but with my girlfriend’s encouragement, I decided to step out of my comfort zone and give it a try. It turned out to be pretty delicious. However, it did stained my lips black. It came in a black pile, was kind of put off by the sight. However, it tasted really good! A must try! 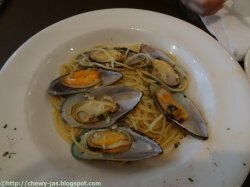 Despite the numerous Italian establishments in Holland Village, this restaurant stands out from the rest boasting several awards including the Singapore Service Star Award in 2010, Singapore Top 100 Signature Dishes, etc. This restaurant has even been featured in Channel U. The facade exudes a buoyant feeling with green plants by both side. Stepping into the restaurant we settled down while listening to the soothing music that was being played. 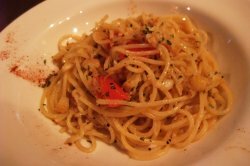 Be sure to try their Spaghetti Aglio Olio E Peperoncino Con Granchi which is actually crab meat pasta tossed with garlic, olive oil and spur chili. 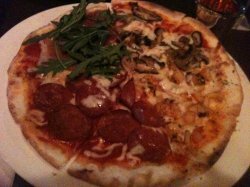 The next item that I shared with my colleague is called Pizza Stagioni. This pizza is cut into 8 different pieces and every two pieces have the same toppings. Mozzarella cheese is the based for all the 8 pieces, the rest of the toppings are mushrooms, parma ham, pepperoni, seafood and tomatoes. The crust was thin and crispy by the edge and soft towards the middle. Toppings were generous. This is a highly recommended dish. 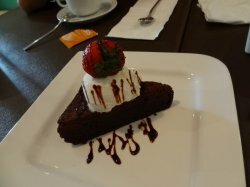 After the main course, we have a sweet dessert to sweeten our visit here. 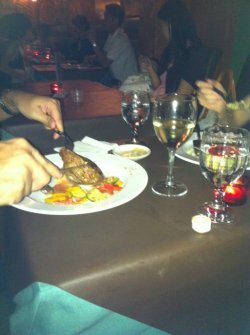 Overall is a nice experience though the passage way might be a bit cramp if you got a seat in the middle of the restaurant. 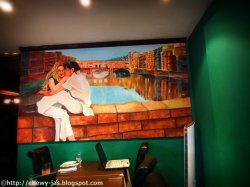 Amici, which means friends in Italian, has been around for quite a while but we've never really gotten down to try it even though there have been quite a number of favourable reviews circulating around on the Internet. As my girlfriend asked me to buy for the Granton card that offered 1-for-1 maincourse last year at the price of $29.90, I decided to bring her to eat for dinner. Before reaching this place, it seems to be under construction which makes it hard to see the place until you are walking over shophouse below Silver Cross Medical Centre at 273A Holland Avenue Singapore 278992. Anyway, it was open as there were customers inside and we made our efforts to reach there on 30 April 2011 around 9.00 p.m. There wasn't a nice waitress in serving us that night. 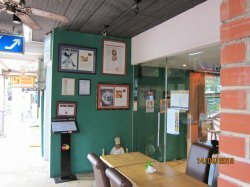 The reason for this food/beverage restaurant is not tempting due to outdoor area facing the noisy road, so we were seated inside and we got the feeling on getting being served well there rather than sitting outside. They were not paying attention and seemed unhappy with coming out for serving us. We had heard good things about Amici before my girlfriend bought this Granton card from an Indian salesman at Courts Lot One Shoppers' Mall during his visit at the retail outlet, but were very disappointing when we went. In fact, I regret in allowing my girlfriend to get reimbursement from me in purchasing this Granton card with an expiry date on 30 April 2011. I discovered that the Indian salesman must be working for a company called Granton Marketing because I also recently got conned into buying the bloody card for another restaurant and pub at Rail Mall with the same amount of money as $30 in which I am entitled to special deals. After paying the bill, I found out that the food was so expensive for dinner. Therefore, no reservation on this restaurant for my dining options in the future. 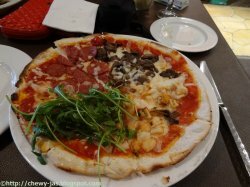 Amici, which means friends in Italian, has been around for quite a while but we've never really gotten down to trying it even though there have been quite a number of favourable reviews circulating around on the internet. That changed when we popped by the Holland Village area to buy some baking supplies and decided to give Amici a shot. Finding the place takes some navigation skills as the place around it seems to be under construction which makes it hard to see the place until you actually walk near it. There is a small al fresco area but I wouldn't recommend that especially if you go in the afternoon and with all the construction going on. The seemingly narrow air conditioned interior lets loose a cosy vibe but watch out for the too close for comfort table spacing and the unforgiving air circulation system which will have you smelling of food within minutes. Complimentary Bread - We got off to a nice start with the warm and crusty complimentary bread that had pockets of what seemed like cranberries. Mildly sweet and comforting. 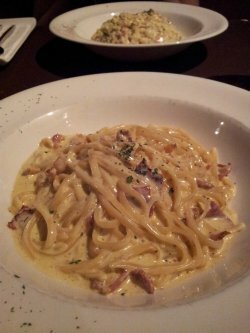 Carbonara - The carbonara wasn't al dente but on the upside, it didn't come across as too rich which toned down the nausea inducing factor. The plentiful bacon pieces were a plus as well. Squid Ink Pasta - Apparently a specialty at Amici, the squid ink pasta was the drenched in squid ink variant, not the made from squid ink kind, of which the latter I personally prefer. I could make out a noticeable tartness in the pasta ( I assume they probably tossed the pasta in tomato sauce first before dunking it in squid ink) which did make it more appetising. What caught my attention was the delectable pieces of cod fish that were crisp on the outside and exuded a natural sweetness from within. 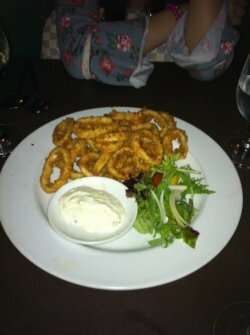 There was also a generous serving of squid rings which served to up the chewy factor. 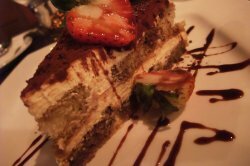 Tiramisu - The desserts were certainly the stars of the evening and it started with tiramisu, which had a great sponge to mascarpone ratio. The sponge wasn't overly soaked in coffee but where's the alcohol?! 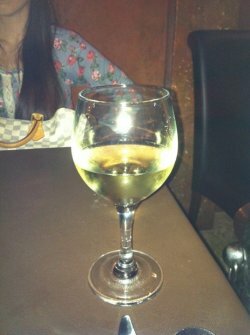 Still very good though and if there's any reason I'll return to Amici, this would be it! 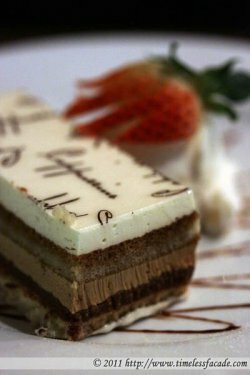 Cappuccino Cake - I'm no big fan of coffee but this dessert surprised me. 5 layers of sponge compacted with a thin layer of wafer in between - firm in texture with a sweet hint of coffee. The ice cream that came alongside didn't gel with me though, seeing that it was literally milk solidified and came across as overpowering. Through the use of a voucher, we had the cheaper main course free, which brought our bill to a more manageable $56 for a 2 pax lunch. Reasonable I may say, but I'll probably only be back for the desserts. Service was decent but then again, the place wasn't packed so it's probably not a good gauge. 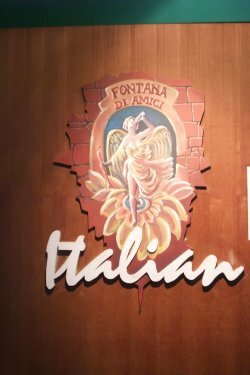 There are several Italian restaurants in Holland Village- La Nonna, Al Dente Trattoria… & Amici is one of them. They used to be popular and have good ratings on the food but perhaps there was a change of chef, the standard seemed to have dropped. The restaurant is cosy , narrow and cramp. 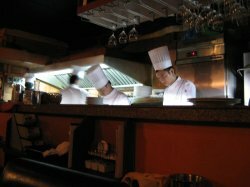 The tables are placed facing the open kitchen where we can observe the chef at work. 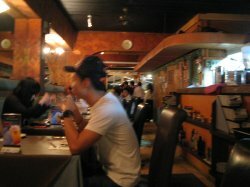 However, the restaurant is not well-ventilated and it gets rather stuffy and smoky having to dine in. 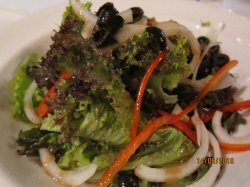 Simple mixed salad with lots of sliced onions and kalamanta olives. Personally I do not really enjoy raw onions in salads. I was observing the chef at work and noticed one of them putting the cod in the microwave wave. What does that supposed to mean? It was oven-baked and not Microwaved! Anyway, back to the cod, the cod looks delicious but when I tried a little, it was way too salty! The ”butter-herb” crust was caramelized and salted and was enough to made me drink at least 3 glasses of water!